I Went to Pride in the Bible Belt. It Was a Revelation. Coastal LGBTQ people are doing themselves a disservice by not experiencing "fly-over country," writes Jennifer Williams. Terrible news recently broke of threats issued by a few parents at a middle school in Achille, Okla., toward a 12-year-old transgender girl. A GoFundMe page was even set up to help this family move from Oklahoma for their own safety. To say that the actions of these parents are disgusting would be an understatement, but this sadly believable story doesn’t paint the whole picture of the LGBTQ experience in Oklahoma. As moved and angry as I am at what happened to this girl and her family, I feel just as moved and happy to share something I witnessed that is more loving, strong, real, empowering, and inspirational than this girl’s tormentors will ever know. Because of the ripping apart of my LGBTQ community due to politics and social media, this past June I found it necessary to go to the middle of our beautiful country, Oklahoma City, and visit its Pride Festival and Parade. What I saw there over three days changed my perspective on where things stands for LGBTQ Americans and gave me greater hope that liberty, freedom and equality will be ours sooner than we realize. In Oklahoma City, Braum’s Ice Cream Shop sits at the corner of 39th Street and Pennsylvania Avenue, which is the start of the Oklahoma City Pride Festival and Parade every last weekend in June. This special ice cream shop serves as a gathering point for Oklahoma City’s under-21 LGBTQ set on Pride Weekend, as 39th Street is the place to be if you are queer and from anywhere near the land of Sooner football and beautiful mornings. Coincidentally for this Jersey girl, the Oklahoma City Pride Festival and Parade falls on the same weekend as the world-famous New York City’s Pride weekend. I have yet to make it to New York for Pride, but I will next year for the 50th anniversary of the Stonewall uprising. For this year, I chose the right Pride weekend in the right part of America. This past mid-June, I purchased airline tickets to Oklahoma City in order to march with the Oklahoma County Republican Party. I had read about them on Facebook, and through an intermediary, offered to march with them in solidarity and to be a bridge to the local LGBTQ community as best I could. I believe that these Republicans and their younger leader, Seth Rott, were acting in good faith. They sincerely wanted to march with their LGBTQ brothers and sisters to show them support, understanding, and love. Unfortunately, their crazy notion of marching with fellow Oklahomans who happen to be lesbian, gay, bisexual, transgender, queer, and/or two-spirited, was taken by a few LGBTQ leaders to be an incredibly radical notion and one that stirred up much controversy within the Oklahoma City Pride leadership. So much so, that after a few rounds of “he said, she said,” the Oklahoma County Republican Party was told there were no spots left in the Pride Parade and that some parade leaders were concerned about violence and safety. For the record, I witnessed only one protester at the parade, a man who stood on a ladder with a red-and-white MAGA hat on and held a sign asking us if we had AIDS. That was it. There was no violence, nor any threat to anyone’s safety. At first I was pretty annoyed to have booked a nonrefundable ticket to Oklahoma City from Newark just before I found out about the Republicans I was marching behind canceled. Fortunately, a local LGBTQ advocate who helped guide the Oklahoma County Republican Party members in their hopes to march (and seemingly to me, make a statement against their own Republican governor signing an anti-LGBTQ adoption bill) offered to help me get around the city and learn about LGBTQ life there. I also had a feeling that he’d show me why we should be looking to Middle America for the best of us and not just on the East and West coasts. Having made this trip to a place I had never been to before and where I previously only knew one person, I am so glad that I went, and I hope that many more of LGBTQ Americans do the same. While I walked through Oklahoma City’s 39th Street neighborhood, I had to remind myself that where I was standing is 1,451 miles from the Stonewall Inn in New York City and 1,623 miles from the site of Compton’s Cafeteria in San Francisco. This burgeoning “gayborhood” of bars, restaurants, shops, and homes offers LGBTQ Americans a second home for them to congregate, become one, feel safe, and,,based on the number of straight or non-trans/two-spirited folks I saw gathered there, change our world one person, one couple, one family at a time. These LGBTQ folks are having a great effect on the world around them, as the number of loving, supportive Christian-denominational churches and groups having booths at the three-day Pride festival and marching in the Sunday night parade was astounding. Given that Oklahoma City is in the nation’s Bible Belt, one cannot see all these religious groups making their presence known while affirming, loving, and offering spiritual support to LGBTQ people and not see that something special is going on. Let alone all the two-spirited and overall LGBTQ representation from the many different Oklahoma Native American tribes; the African-American/black participation; the very diverse crowds; the amount of mainstream American corporate support; and for sure, all the Mama Bears, Papa Bears, and allies openly offering their support to everyone. Luckily for me, I struck up a conversation with Mary Horn, who is the operations manager of a wonderful advocacy organization called Freedom Oklahoma, at its Pride booth on the day before the parade. After chatting about our different advocacy work, the amazing LGBTQ community in Oklahoma, and my dilemma of being at her Pride with no one to march with, she graciously offered to let me march with Freedom Oklahoma the next night. I, of course, said yes and was thrilled to participate. Admittedly, that is something that probably never would have happened in New York City. On parade night, I met up with Freedom Oklahoma at its headquarters, which sits along the parade marchers’ rendezvous point. As far as the eye could see, the 100 registered floats and marching groups filled the summer horizon. No matter the circumstances that brought me to Oklahoma, a state that I was long told to fear, my heart swelled as I saw my community and my family in full celebration of their pride, their survival, and their hopes in each other. It is hard to describe, but here in Oklahoma City, it feels like Pride is more of a celebration of life and a heartfelt coming together and less like a party than in some places. It seems to mean more here on a lot of levels. Having experienced all of this, I was also glad to know that those local Republicans who wanted to march this year will be trying to make it happen next year. After speaking with a number of local LGBTQ folks over several days, I believe that these Republicans will be welcomed and made to feel at home if they march at Pride next year. A greater conversation will begin on 39th Street and that would be good, even if they do get a few side-eyes and jaundiced looks from some people at first. Having Republicans march at Pride weekend won’t change our political system overnight, but in the long term, it may help turn back the some of the hate that causes 12-year-old transgender girls to leave their hometowns for another state. That is the power of Pride. 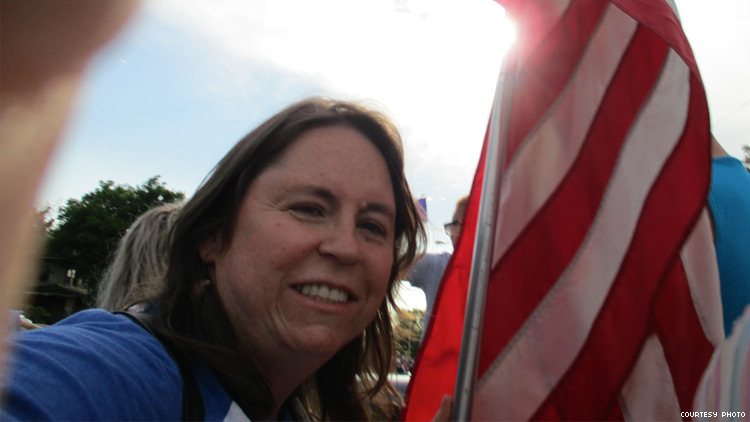 As I climbed into the back of Freedom Oklahoma’s pickup truck to ride with the group in the Pride Parade, by pure chance I was asked to hold our American flag as we rolled over several miles of the parade and passed tens of thousands of my tribe. While I held Old Glory, I felt that I was home here. We on the coasts should take a pause, look toward a different part of LGBTQ America, and see if there is a better way. I think many of us will be pleasantly surprised at what we see and hopefully take inspiration from it. JENNIFER WILLIAMS is a transgender activist and was the first out trans delegate at the Republican National Convention.